obsessed with knitting: process or product? Like many knitters, I usually say that for me knitting is about the process rather than the product. But is that true? Lately I have come to think that this statement about the process being more important than the product is not entirely true for me, but really a way of apologizing in advance if the product of all those hours spent knitting should turn out badly. And many times it has turned out that way in spite of my effort to pick out the right yarn and pattern and knit it correctly. Process does enter into it. Knitting is thought to be a meditative act because it centers you on the work in front of you enabling you to clear your mind of everything else. I have experienced that at times, but for me gardening works better as meditation. Although I do like to knit, I like to read more, so I combine reading with knitting by listening to audiobooks as I knit. That is why I knit so much - because I read so much. It is still a relaxing process though, knitting and reading away. Almost as much as I like reading, I like clothes and fashion. And there lies the true excitement and glamour of knitting: hoping to make something wonderful that will look great and be an asset to the wardrobe. All of this is a way of apologizing in advance, because I have reason to fear that the project I cast on over the weekend will turn out badly. It all started when I was browsing Ravelry to see how other knitters had used Knit Picks Shimmer, a variegated lace weight alpaca/silk blend. I had ordered some, and my idea was to use it for a lighter weight Clapotis that would not be so chunky as the worsted weight versions I had made and would lay better on the neck as a scarf. As I mentioned in my Clapotis post (linked above), I am not crazy about variegated yarn, mainly because of the chunky stripes it produces. The Clap is perfect for variegation because it breaks up the stripes diagonally. Somehow that looks more graceful to me. I was looking at Shimmer products in Ravelry hoping to glean information about how knitters had used lace weight yarns for Clapotis. I came across an interesting project by a knitter using the name Flyingneedle who made Cornelia Tuttle Hamilton's Klaralund in Shimmer. 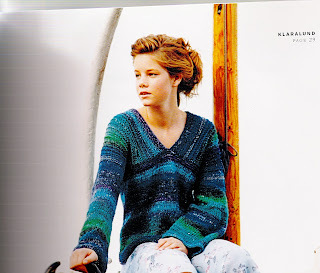 Here is Klaralund as she appears in Hamilton's Noro book Number Two using the yarn she specified: Noro Silk Garden, a worsted weight. See the chunky stripes. Flying needle's version, (linked above) which I can't seem to grab for this post, has daintier speckly stripes. In fact, the variegated pattern of Shimmer, as used for Klaralund reminds me of sweaters from my youth - more about that in the next post. For now, suffice it to say that it is doubtful that Klarlund will look good on me. Notice how the model in the photo here seems to lack breasts. I have humonguous ones. As for Flying Needle, she seems to have breasts, but she is thin and elegant in shape to the extent that she should be a model. I am short and chunky, and while some clothes look passable on me because I am well-proportioned, I will never be anyone's clothes horse. You might ask, if I am dubious about the material and nearly sure that the shape will not suit me, why am I making this sweater. I am not entirely sure, but I have some ideas, which I will explore in the next post. Your process/product comments resonated with me. I have come to realize a bit better that I control the entire knitting product process, from pattern and fiber selection to fit. What if I goof? In the store I can try a garment on and reject it because the style doesn't work for me. I'm learning that knitting is similar to catalog shopping - just because the picture makes me oohh and ahhh and the garment is breathtaking doesn't mean it will look good on me. Thanks for writing about your experience with this. It has helped me.